from the genre. But once he did come along, he took over the title and remained its cover feature as long as it continued to be published. Crack Comics #27, where Captain Triumph first appeared, told of an attack by Nazi saboteurs, which killed a man named Michael Gallant (no relation). But that wasn't the end of him. He appeared as a ghost to his twin brother, Lance, and made the living man a superhero. By touching a T-shaped birthmark on his wrist, Lance could have Michael enter his body and imbue it with super strength, invulnerability, and the ability to fly. It worked as a toggle — touching the birthmark again would separate the two, freeing Michael to flit around, ghost-like, and gather intelligence for Captain Triumph. He had a minimal costume, but not as minimal as that of Crimebuster, which consisted only of a hockey uniform. Cap wore ordinary white (later light blue) jodhpurs, which for some reason were popular among adventure heroes of the time, with a plain, red tunic, brown boots, and no mask. It was enough to get across the idea he was a superhero, but since the genre was fading, didn't emphasize the fact. Cap's writer is unknown, but as the series opened, the artist was Alfred Andriola, former assistant to Milton Caniff on Terry & the Pirates. Andriola had also drawn a newspaper comic based on author Earl Derr Biggers's famous character, Charlie Chan. He stayed with Captain Triumph a mere five months, leaving to create the character he's best remembered for, Kerry Drake. He was followed by a succession of other talents, none of which especially stood out. The publisher was Quality Comics, which had several characters with higher profiles, such as Blackhawk and Phantom Lady (as well as quite a few with lower ones, such as Flatfoot Burns and The Human Bomb). Crack Comics had started out monthly, like most 1940s anthology titles, but dropped down to bimonthly shortly after World War II began, due to wartime paper shortages. It switched to quarterly about a year after Captain Triumph joined the line-up. When the war was over, most surviving anthologies ramped back up to monthly, but Crack only got back up to the point of coming out in odd-numbered months. But it did outlast most of the others, succumbing with its 62nd issue, dated September, 1949. 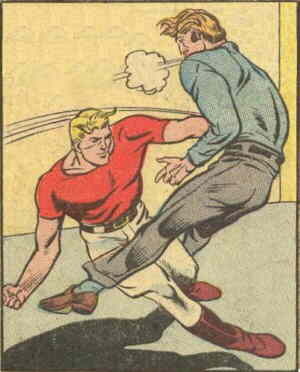 DC Comics acquired the Quality characters in 1956, but didn't use Captain Triumph for several more decades. Even when a half-dozen of them were revived as The Freedom Fighters, he wasn't there. He didn't even get an entry in Who's Who in the DC Universe, the company's attempt to list and describe every character it owned as of the mid-1980s. He did show his face in an issue or two of DC's All-Star Squadron, and was briefly seen in an "Elseworlds" story (similar to Marvel's What If, examining what would have happened if a key event in the fictional universe's history had gone differently). In 2002, a latter-day incarnation of The Teen Titans depicted Captain Triumph as half a murderer. Michael took over Lance's body completely, and killed Johnny Quick's daughter's boyfriend. When last seen, he was under psychiatric examination. A sad end for a formerly heroic character — but in the post-Watchmen era, these aren't your father's superheroes.